The risk of delayed collapse is real: The cupola of Our Lady of Angels Church, damaged and cracked by the Sept. 19 quake, split in half and crashed to the ground Sunday evening. There were no injuries. [Residents] continued calling police Monday as apparently new cracks appeared in their apartment buildings or existing ones worsened, even as the city struggled to get back to normality. Education Secretary Aurelio Nuno said Monday that officials had cleared only 676 of Mexico City’s nearly 9,000 schools to reopen Tuesday and said it could be two to three weeks before all are declared safe, leaving hundreds of thousands of children idle. Mexico City Mayor Miguel Angel Mancera said at least seven schools were among the buildings thought to be at risk of tumbling. The frustrations of families with loved ones missing [was evident] Monday night at the largest remaining search site, a collapsed seven-story office building. “What are they hiding from us,” asked Javier Saucedo, father of 27-year-old Angel Javier Saucedo, who worked in the building. He complained that authorities have been removing bodies from the site without letting families know. “Why does our own government toy with the pain of the families,” he said. “What they are doing is not fair.” He called for President Enrique Pena Nieto and the mayor to come to the site and clear things up for them. At several points in the city, employees gathered on sidewalks in front of their workplaces Monday refusing to enter because they feared their buildings could collapse. Mayor Mancera said 360 “red level” buildings would either have to be demolished or receive major structural reinforcement. An additional 1,136 are reparable, and 8,030 buildings inspected so far were found to be habitable. Search teams were still digging through dangerous piles of rubble, hoping against the odds to find survivors. The city has accounted for 186 of the 326 dead nationwide. The smell of rotting corpses increasingly hung over the largest remaining search site near the city’s center. Juan Carlos Penas, in charge of a Spanish rescue team working at the remains of what had been a seven-story office building, said Monday that the work was very slow because the rubble was so unstable. Rescuers managed to make a small entry between the second and third floors and insert a camera, but they did not immediately find anyone. While no one has been found alive since last Wednesday, relatives of the trapped, anxious to cling to any hope of rescue, won injunctions against actions that could cause the ruins to collapse further. One by one, other searches have closed down in recent days, after sniffer dogs were sent in and didn’t find life and thermal imaging devices turned up no body heat signatures. Heavy machinery moved in to begin removing the mountains of debris. Empty lots began to appear where just days ago a building stood. At the site of a collapsed factory that held various businesses near the city center, the rubble had already been cleared, leaving behind the concrete foundation. People left flowers Monday in memory of those who perished there. From Associated Press. Reprinted here for educational purposes only. May not be reproduced on other websites without permission from the AP. NOTE: This week’s World Events article is a human interest news story. Human interest stories differ from the regular news – they are sometimes referred to as “the story behind the story.“ The major news articles of the day tell of important happenings. Human interest stories tell of how those happenings have impacted the people or places around the story. a) How many people died following the September 19 earthquake in Mexico? b) How many buildings collapsed after the earthquake? c) What is the assessment on the buildings that have been inspected after the earthquake? d) What is the problem with the schools in Mexico City? 3. Why are employees at several buildings around the city refusing to go to work? 4. a) Why have relatives of those not yet rescued/recovered from several buildings around the city obtained court injunctions preventing authorities from using backhoes or bulldozers to remove rubble? b) What concern does the father of 27-year-old Angel Javier Saucedo, who worked in a collapsed seven-story office building have? c) Why is the work of the recovery teams going so slowly? 5. Why have searches at other buildings closed down in recent days? 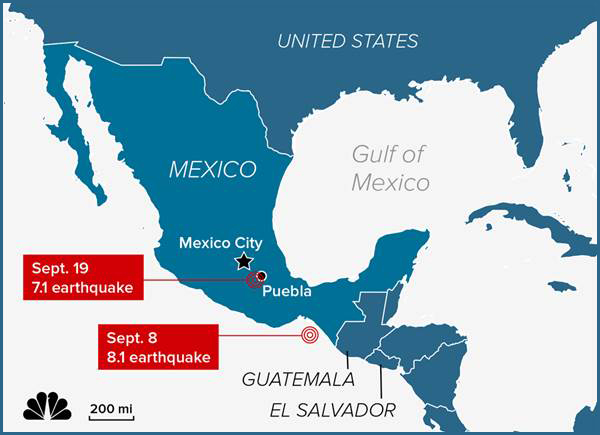 Each year on September 19, cities across Mexico stage an earthquake drill (emergency disaster simulations and evacuations ). The drill falls on the anniversary of an 8.0-magnitude earthquake that shook Mexico's capital in 1985. In 1985 hundreds of buildings collapsed and nearly 10,000 people died. The annual drill began this year in Mexico City around 11 a.m. on Tuesday, September 19th, just like it does every year. The alert went out over radio, television, phones and public loud speakers. People left homes, offices and shops and headed to designated safe areas promoted days ahead of time. Then, around two hours later, the real thing struck.